As recently as a decade ago a review of the world literature on the status of the efficacy and safety of cannabinoids for pain and spasticity revealed that only nine randomized studies of acceptable quality had been conducted [1 Campbell FA, Tramer MR, Carroll D, Reynolds DJ, Moore RA, McQuay HJ. Are cannabinoids an effective and safe treatment option in the management of pain? A qualitative systematic review BMJ 2001; 323(7303): 3-6.]. All of these were single dose studies comparing oral synthetic THC (or cannabinoid analogs or congeners) to codeine or placebo. Two were “N of 1” randomized trials and two were of very small samples of acute post-operative pain. The remaining trials primarily addressed chronic cancer-related pain. Taken as a group it appeared that oral cannabinoids (e.g., THC 10mg) outperformed placebo and were analgesically equivalent to codeine 60mg; higher doses (THC 20mg) were comparable to codeine 120mg, but had a much higher incidence of adverse effects, particularly sedation [2 Noyes R, Brunk SF, Avery DA, Canter AC. The analgesic properties of delta-9-tetrahydrocannabinol and codeine Clin Pharmacol Ther 1975; 18(1): 84-9.]. Authoritative reviews judged cannabinoids as being unlikely to have a role in acute pain management, but suggested there was enough evidence for efficacy in chronic neuropathic pain and muscle spasticity to warrant further research [1 Campbell FA, Tramer MR, Carroll D, Reynolds DJ, Moore RA, McQuay HJ. Are cannabinoids an effective and safe treatment option in the management of pain? A qualitative systematic review BMJ 2001; 323(7303): 3-6.]. Smoking cannabis provides rapid and efficient delivery of THC to brain. THC can be detected immediately in plasma after the first puff of a cigarette; peak concentrations occur within 10 minutes, then decrease to approximately 60% of peak by 15 minutes and 20% of peak by 30 minutes, but there can be wide inter-individual variation in concentrations achieved [3 Huestis MA. Pharmacokinetics and metabolism of the plant cannabinoids, delta9-tetrahydrocannabinol, cannabidiol and cannabinol Handb Exp Pharmacol 2005; (168): 657-90.]. Rapid onset and predictable decay means that self-titration of dosing is attainable. A series of randomized clinical trials at the University of California Center for Medicinal Cannabis Research (CMCR) investigated the short-term efficacy of smoked cannabis for neuropathic pain. Sponsored by the State of California Medical Marijuana Research Act of 1999, and conducted under the auspices of the Department of Health and Human Services, the National Institute on Drug Abuse, and the Food and Drug Administration, this research allocated participants to smoke cannabis cigarettes containing from 1% to 8% THC by weight (4 to 32 mg THC) or to placebo cannabis cigarettes from which THC had been extracted. The total daily dose of THC ranged from 4 mg to 128 mg. Two trials enrolled patients with painful HIV peripheral neuropathy [4 Abrams DI, Jay CA, Shade SB, et al. Cannabis in painful HIV-associated sensory neuropathy: a randomized placebo-controlled trial Neurology 2007; 68(7): 515-21., 5 Ellis RJ, Toperoff W, Vaida F, et al. Smoked medicinal cannabis for neuropathic pain in HIV: a randomized, crossover clinical trial Neuropsychopharmacol 2009; 34(3): 672-80. ]; one consisted of mixed neuropathic pain due to peripheral or central dysfunction of the nervous system (i.e., complex regional pain syndrome, peripheral neuropathy, and traumatic focal nerve or spinal cord injury) [6 Wilsey B, Marcotte T, Tsodikov A, et al. A randomized, placebo-controlled, crossover trial of cannabis cigarettes in neuropathic pain J Pain 2008; 9(6): 506-21.]. Patients were allowed to continue their usual regimen of analgesics. Results consistently indicated that cannabis significantly reduced pain intensity, with patients reporting 34%-40% decrease on cannabis compared to 17-20% on placebo. Moreover a significantly greater proportion of individuals reported at least 30% reduction in pain on cannabis (46%-52%) compared to placebo (18%-24%) [4 Abrams DI, Jay CA, Shade SB, et al. Cannabis in painful HIV-associated sensory neuropathy: a randomized placebo-controlled trial Neurology 2007; 68(7): 515-21.-6 Wilsey B, Marcotte T, Tsodikov A, et al. A randomized, placebo-controlled, crossover trial of cannabis cigarettes in neuropathic pain J Pain 2008; 9(6): 506-21. ], which is relevant since 30% decrease in pain intensity is generally associated with reports of improved life quality [7 Farrar JT, Young JP Jr, LaMoreaux L, Werth JL, Poole RM. Clinical importance of changes in chronic pain intensity measured on an 11-point numerical pain rating scale Pain 2001; 94(2): 149-58.]. The number needed-to-treat to achieve a 30% reduction in pain intensity was 3.5-4.5, a range achieved by standard non-opioid analgesics (i.e., noradrenergic antidepressants and anticonvulsants). Interestingly “medium” dose cannabis cigarettes (3.5% THC) were as effective as higher dose (7% THC) [6 Wilsey B, Marcotte T, Tsodikov A, et al. A randomized, placebo-controlled, crossover trial of cannabis cigarettes in neuropathic pain J Pain 2008; 9(6): 506-21.]. In this same vein, a fourth trial employing an experimental model of neuropathic pain (intradermal injection of capsaicin) in healthy volunteers suggested that there may be a “therapeutic window” or optimal dose for smoked cannabis: low dose cigarettes (2% THC) had no analgesic effect, high dose (8%) was associated with reports of significant pain increase, and medium dose cannabis cigarettes (4% THC) provided significant analgesia [8 Wallace M, Schulteis G, Atkinson JH, et al. Dose-dependent effects of smoked cannabis on capsaicin-induced pain and hyperalgesia in healthy volunteers Anesthesiology 2007; 107(5): 785-96.]. Separately, another recent placebo-controlled, cross-over study of neuropathic pain due to surgery or injury examined the effect of 25 mg doses of smoked cannabis at various potencies (2.5%, 6%, and 9.4% THC by weight), administered three times daily for 14 days [9 Ware MA, Wang T, Shapiro S, et al. Smoked cannabis for chronic neuropathic pain: a randomized controlled trial CMAJ 2010; 182(14): E694-701.]. Results suggested that although lower potency dosing was ineffective, 9.4% THC produced modest but significant analgesic effects compared to placebo, in a sample selected for failure to respond to conventional therapy. Oral preparations are available as synthetic THC (dronabinol, MarinolR) and a synthetic analog of THC (nabilone, CesametR). Absorption from the gut is slower and exhibits a delayed peak plasma concentration compared to smoking with bioavailability ranging from about 5-20% of dose; peak concentrations occur 1-6 hours after ingestion, with a magnitude approximately 10% of that achieved with smoking [3 Huestis MA. Pharmacokinetics and metabolism of the plant cannabinoids, delta9-tetrahydrocannabinol, cannabidiol and cannabinol Handb Exp Pharmacol 2005; (168): 657-90.]. Most research using oral preparations has targeted neuropathic pain and spasticity associated with multiple sclerosis (MS). These randomized trials suggest that dronabinol (up to 25 mg daily) significantly reduces pain compared to placebo (50% “improved” on dronabinol compared to 30% on placebo, p < .05) [10 Zajicek J, Fox P, Sanders H, et al. Cannabinoids for treatment of spasticity and other symptoms related to multiple sclerosis (CAMS study): multicentre randomised placebo-controlled trial Lancet 2003; 362(9395): 1517-26. ], with a number-needed-to-treat for 50% pain reduction of 3.5, which is in the range of efficacy observed for standard non-opioids [11 Svendsen KB, Jensen TS, Bach FW. Does the cannabinoid dronabinol reduce central pain in multiple sclerosis? Randomised double blind placebo controlled crossover trial BMJ 2004; 329(7460): 53.]. Effects on spasticity are mixed: there may be no observable change in examiner-rated muscle tone, but patients report significant relief [10 Zajicek J, Fox P, Sanders H, et al. Cannabinoids for treatment of spasticity and other symptoms related to multiple sclerosis (CAMS study): multicentre randomised placebo-controlled trial Lancet 2003; 362(9395): 1517-26.]. There is less research with nabilone, although one three-week randomized crossover trial reported that nabilone 2mg provided modest analgesia, comparable to dihydrocodeine 240mg daily in neuropathic pain [12 Frank B, Serpell MG, Hughes J, Matthews JN, Kapur D. Comparison of analgesic effects and patient tolerability of nabilone and dihydrocodeine for chronic neuropathic pain: randomised, crossover, double blind study BMJ 2008; 336(7637): 99-201.]. Although serotonin receptor (5 HT3) antagonists (e.g., ondansetron, ZofranR) and Substance P/neurokinin-1 (NK-1) receptor antagonists (e.g., aprepitant, EmendR) are the mainstays for treatment, dronabinol and nabilone are also FDA-approved for control of acute and delayed nausea and emesis due to cancer chemotherapy. Meta-analyses indicate these cannabinoids are equivalent to or more effective than metoclopraminde and neuroleptics, but their side effect profile is less favorable in terms of sedation, dizziness, dysphoria, hypotension, and anxiety [13 Tramer MR, Carroll D, Campbell FA, Reynolds DJ, Moore RA, McQuay HJ. Cannabinoids for control of chemotherapy induced nausea and vomiting: quantitative systematic review BMJ 2001; 323(7303): 16-21., 14 Ben Amar M. Cannabinoids in medicine: A review of their therapeutic potential J Ethnopharmacol 2006; 105(1-2): 1-25.]. There are no head-to-head comparisons of cannabinoids with serotonin 5 HT3 receptor or Substance P/NK-1 receptor antagonists. Anorexia, early satiety, weight loss and cachexia are prevalent in late stage cancer and advanced HIV disease, but there are few effective treatments. Trials in AIDS patients with clinically significant weight loss indicated that dronabinol 5mg daily significantly outperformed placebo in terms of short term appetite enhancement (38% vs. 8% at 6 weeks), and that these effects persisted for up to 12 months [15 Beal JE, Olson R, Laubenstein L, et al. Dronabinol as a treatment for anorexia associated with weight loss in patients with AIDS J Pain Symptom Manag 1995; 10(2): 89-97., 16 Beal JE, Olson R, Lefkowitz L, et al. Long-term efficacy and safety of dronabinol for acquired immunodeficiency syndrome-associated anorexia J Pain Symptom Manag 1997; 14(1): 7-14. ], but were not accompanied by significant differences in weight gain, perhaps because of disease-associated energy wasting. The major practical limitations are the accompanying psychoactive side effects, and the problems of oral administration (eg, delayed onset of action, variable absorption, extended duration of effects). Outside the US, extracts of whole plant are licensed and available in capsules (CannadorR), with the main constituents being THC and the non-psychoactive plant cannabinoid, cannabidiol, in a ratio of 2:1. Rectal suppositories are also used to deliver THC hemisuccinate. Several small to medium-sized, randomized, controlled trials in MS suggest improvements in pain and perceived spasticity at daily doses of THC ranging from 7.5mg to 27.5mg [10 Zajicek J, Fox P, Sanders H, et al. Cannabinoids for treatment of spasticity and other symptoms related to multiple sclerosis (CAMS study): multicentre randomised placebo-controlled trial Lancet 2003; 362(9395): 1517-26., 17 Pertwee RG. Cannabinoids and multiple sclerosis Mol Neurobiol 2007; 36(1): 45-59., 18 Wade DT, Robson P, House H, Makela P, Aram J. A preliminary controlled study to determine whether whole-plant cannabis extracts can improve intractable neurogenic symptoms Clin Rehabil 2003; 17(1): 21-9.]. In some trials [19 Vaney C, Heinzel-Gutenbrunner M, Jobin P, et al. Efficacy, safety and tolerability of an orally administered cannabis extract in the treatment of spasticity in patients with multiple sclerosis: a randomized, double-blind, placebo-controlled, crossover study Mult Scler 2004; 10(4): 417-24.] but not others [10 Zajicek J, Fox P, Sanders H, et al. Cannabinoids for treatment of spasticity and other symptoms related to multiple sclerosis (CAMS study): multicentre randomised placebo-controlled trial Lancet 2003; 362(9395): 1517-26., 20 Wade DT, Makela P, Robson P, House H, Bateman C. Do cannabis-based medicinal extracts have general or specific effects on symptoms in multiple sclerosis? A double-blind, randomized, placebo-controlled study on 160 patients Mult Scler 2004; 10(4): 434-1.] observer-assessed spasticity also improved. The hazards of smoking and the pharmacokinetic limitations of ingestion of cannabinoids has led to a search for alternative systems of administration. One alternative is devices which vaporize cannabis leaves by heating the plant product to below the temperature of combustion (175-225 degrees C), permitting inhalation of volatilized gases minus hazardous pyrroles produced by burning. Preliminary work using plant material with a range of THC content (e.g., 1-7% THC) suggests that there is rapid onset, with peak concentrations and six-hour area under the plasma concentration curves comparable to those achieved by smoking [21 Abrams DI, Vizoso HP, Shade SB, Jay C, Kelly ME, Benowitz NL. Vaporization as a smokeless cannabis delivery system: a pilot study Clin Pharmacol Ther 2007; 82(5): 572-8.]. Vaporization is not a perfect solution since carbon monoxide is formed, but levels are significantly lower than with smoking [21 Abrams DI, Vizoso HP, Shade SB, Jay C, Kelly ME, Benowitz NL. Vaporization as a smokeless cannabis delivery system: a pilot study Clin Pharmacol Ther 2007; 82(5): 572-8.]. Clinical trials are currently in progress at the CMCR assessing the efficacy of vaporized cannabis as an analgesic in chronic neuropathic pain. Sublingual delivery systems of whole cannabis plant extract, which employ metered spray devices to deliver measured doses of THC (2.7mg) and cannabidiol (2.5mg), are undergoing Phase IIb/III trials in the US, and are licensed elsewhere for cancer pain and multiple sclerosis-associated neuropathic pain and spasticity (nabiximols, SativexR). The apparent advantages of such systems are known cannabinoid concentrations, predetermined dosing aliquots, and time-out systems which may help prevent overuse. Some placebo-controlled trials suggest significant analgesia in neuropathic pain due to multiple sclerosis [22 Rog DJ, Nurmikko TJ, Friede T, Young CA. Randomized, controlled trial of cannabis-based medicine in central pain in multiple sclerosis Neurology 2005; 65(6): 812-9.] and mixed neuropathy (e.g., post-herpetic, traumatic, vascular neuropathies, [23 Nurmikko TJ, Serpell MG, Hoggart B, Toomey PJ, Morlion BJ, Haines D. Sativex successfully treats neuropathic pain characterised by allodynia: a randomised, double-blind, placebo-controlled clinical trial Pain 2007; 133(1-3): 210-0.] but others do not [20 Wade DT, Makela P, Robson P, House H, Bateman C. Do cannabis-based medicinal extracts have general or specific effects on symptoms in multiple sclerosis? A double-blind, randomized, placebo-controlled study on 160 patients Mult Scler 2004; 10(4): 434-1.]. Other controlled trials suggest efficacy for cancer-related pain inadequately responsive to opioid analgesia [24 Johnson JR, Burnell-Nugent M, Lossignol D, Ganae-Motan ED, Potts R, Fallon MT. Multicenter, double-blind, randomized, placebo-controlled, parallel-group study of the efficacy, safety, and tolerability of THC:CBD extract and THC extract in patients with intractable cancer-related pain J Pain Symptom Manag 2010; 39(2): 167-79.]. Responders participating in the open label extension phases of controlled trials appear to maintain analgesia on one-year follow-up [23 Nurmikko TJ, Serpell MG, Hoggart B, Toomey PJ, Morlion BJ, Haines D. Sativex successfully treats neuropathic pain characterised by allodynia: a randomised, double-blind, placebo-controlled clinical trial Pain 2007; 133(1-3): 210-0.]. In regard to spasticity in multiple sclerosis, a recent meta-analysis combining three trials with nabiximols in over 600 patients noted that mean intensity of patient rated spasticity was significantly reduced compared to placebo [20 Wade DT, Makela P, Robson P, House H, Bateman C. Do cannabis-based medicinal extracts have general or specific effects on symptoms in multiple sclerosis? A double-blind, randomized, placebo-controlled study on 160 patients Mult Scler 2004; 10(4): 434-1., 25 Collin C, Davies P, Mutiboko IK, Ratcliffe S. Randomized controlled trial of cannabis-based medicine in spasticity caused by multiple sclerosis Eur J Neurol 2007; 14(3): 290-6., 26 Wade DT, Collin C, Stott C, Duncombe P. Meta-analysis of the efficacy and safety of Sativex (nabiximols), on spasticity in people with multiple sclerosis Mult Scler 2010; 16(6): 707-14. ], and that the proportion of “responders” (30% reduction) was also significantly greater, with about 37% on the cannabinoid compared to 26% on placebo experiencing relief. Those reporting relief of spasticity seemed to maintain their gains over one year follow-up [27 Wade DT, Makela PM, House H, Bateman C, Robson P. Long-term use of a cannabis-based medicine in the treatment of spasticity and other symptoms in multiple sclerosis Mult Scler 2006; 12(5): 639-45.]. As with other studies noted above, observer-rated spasticity is often not reduced [20 Wade DT, Makela P, Robson P, House H, Bateman C. Do cannabis-based medicinal extracts have general or specific effects on symptoms in multiple sclerosis? A double-blind, randomized, placebo-controlled study on 160 patients Mult Scler 2004; 10(4): 434-1., 25 Collin C, Davies P, Mutiboko IK, Ratcliffe S. Randomized controlled trial of cannabis-based medicine in spasticity caused by multiple sclerosis Eur J Neurol 2007; 14(3): 290-6., 28 Farrar JT, Troxel AB, Stott C, Duncombe P, Jensen MP. Validity, reliability, and clinical importance of change in a 0-10 numeric rating scale measure of spasticity: a post hoc analysis of a randomized, double-blind, placebo-controlled trial Clin Ther 2008; 30(5): 974-85. ]; however, a recent CMCR study did find a significant reduction in observed spasticity among those administered active smoked marijuana vs. placebo marijuana [58 Corey-Bloom J, Wolfson T, Gamst A, et al. A randomized, placebo-controlled trial of smoked cannabis for spasticity in multiple sclerosis CMAJ (In press)]. Because of the acute psychoactive effects of the experimental agent there is understandable concern that blinding cannot be preserved in placebo-controlled clinical trials of cannabinoids, particularly with cross-over designs. Few studies assess masking, but two cross-over trials tested maintenance of the blind by asking participants to “guess” assignment at different points of the study. Results suggest that participants, whether they are naïve or experienced cannabis users, are in the first week of a trial no more likely than by chance to guess assignment [5 Ellis RJ, Toperoff W, Vaida F, et al. Smoked medicinal cannabis for neuropathic pain in HIV: a randomized, crossover clinical trial Neuropsychopharmacol 2009; 34(3): 672-80., 9 Ware MA, Wang T, Shapiro S, et al. Smoked cannabis for chronic neuropathic pain: a randomized controlled trial CMAJ 2010; 182(14): E694-701.]. With continued exposures rates of correct guesses exceed 75%, but exceed chance only in a high potency arm (9%) [9 Ware MA, Wang T, Shapiro S, et al. Smoked cannabis for chronic neuropathic pain: a randomized controlled trial CMAJ 2010; 182(14): E694-701.]. In another study correct guessing was related to two factors: whether the subject received placebo or cannabis first; and when during the study the participant guessed assignment [5 Ellis RJ, Toperoff W, Vaida F, et al. Smoked medicinal cannabis for neuropathic pain in HIV: a randomized, crossover clinical trial Neuropsychopharmacol 2009; 34(3): 672-80.]. Among individuals randomized to receive placebo first, guessing was no better than chance through the end of the first treatment week, whereas the majority of those randomized to receive cannabis first correctly guessed their treatment assignment at all time points. Furthermore, by the conclusion of the study, when all subjects had been given the opportunity to compare the cannabis placebo and treatments, even those randomized to receive placebo first correctly guessed their treatment assignment [5 Ellis RJ, Toperoff W, Vaida F, et al. Smoked medicinal cannabis for neuropathic pain in HIV: a randomized, crossover clinical trial Neuropsychopharmacol 2009; 34(3): 672-80.]. This raised the possibility that some of the pain reduction was placebo driven. Secondary analyses to assess whether correct treatment guessing influenced treatment responses showed that in the placebo group during the first treatment week, when guessing was no better than chance, cannabis still provided pain relief superior to that of placebo. This finding suggests that although placebo effects were present, treatment effects were independent [5 Ellis RJ, Toperoff W, Vaida F, et al. Smoked medicinal cannabis for neuropathic pain in HIV: a randomized, crossover clinical trial Neuropsychopharmacol 2009; 34(3): 672-80.]. Acutely and over the longer term cannabis may have unwanted systemic and psychoactive adverse effects that must be taken into consideration in chronic pain populations, who have high rates of co-occurring medical illness (eg, cardiovascular disease) and co-morbid psychiatric and substance use disorders. In general these effects are dose-related, are of mild to moderate severity, appear to decline over time, and are reported less frequently in experienced than in naïve users. Reviews suggest the most frequent side effects are dizziness or lightheadedness (30%-60%), dry mouth (10%-25%), fatigue (5%-40%), muscle weakness (10%-25%), myalgia (25%), and palpitations (20%) [17 Pertwee RG. Cannabinoids and multiple sclerosis Mol Neurobiol 2007; 36(1): 45-59.]. Cough and throat irritation are reported in trials of smoked cannabis [9 Ware MA, Wang T, Shapiro S, et al. Smoked cannabis for chronic neuropathic pain: a randomized controlled trial CMAJ 2010; 182(14): E694-701.]. Tachycardia and postural hypotension are infrequent but caution is warranted in patients with cardiovascular disease, and possibly younger adults who intend to embark on very vigorous physical activity. At higher doses, sedation and ataxia with loss of balance are frequent. Participants in some but not all studies report euphoria: the relative absence of psychoactive effect has been attributed to the observation that plasma concentrations obtained in clinical trials are often <25% of those achieved by “recreational” users (eg, 25ng/ml vs >100ng/ml) [9 Ware MA, Wang T, Shapiro S, et al. Smoked cannabis for chronic neuropathic pain: a randomized controlled trial CMAJ 2010; 182(14): E694-701.]. After repeated smoked or oral marijuana doses, tolerance is rapidly acquired (in two to 12 days) to many of its adverse effects, e.g., cardiovascular, autonomic, and many subjective and cognitive effects [29 Jones RT, Benowitz NL, Herning RI. Clinical relevance of cannabis tolerance and dependence J Clin Pharmacol 1981; 21(8-9 Suppl): 143S-52S.]. After exposure is stopped, tolerance is lost with similar rapidity. There is little systematic data on timeline to tolerance of either adverse or therapeutic effects, like analgesia. Concerns have long been voiced that rapid tolerance to adverse effects might portend tolerance to beneficial effects [29 Jones RT, Benowitz NL, Herning RI. Clinical relevance of cannabis tolerance and dependence J Clin Pharmacol 1981; 21(8-9 Suppl): 143S-52S.]. Data from studies using oral sprays of cannabinoids or dronabinol in multiple sclerosis report that individuals can reduce the incidence and severity of adverse effects by downward self-titration without loss of analgesia [17 Pertwee RG. Cannabinoids and multiple sclerosis Mol Neurobiol 2007; 36(1): 45-59.]. 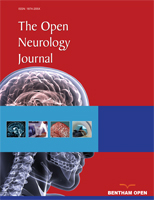 Other studies in this population note that overall the incidence and severity of adverse effects diminishes over time without evidence of tolerance to analgesic effects [20 Wade DT, Makela P, Robson P, House H, Bateman C. Do cannabis-based medicinal extracts have general or specific effects on symptoms in multiple sclerosis? A double-blind, randomized, placebo-controlled study on 160 patients Mult Scler 2004; 10(4): 434-1., 22 Rog DJ, Nurmikko TJ, Friede T, Young CA. Randomized, controlled trial of cannabis-based medicine in central pain in multiple sclerosis Neurology 2005; 65(6): 812-9.]. Yet it is rare that clinical trials of cannabinoids extend follow-up beyond 12 weeks, leaving questions on maintenance of gains or need for dose escalation unanswered [10 Zajicek J, Fox P, Sanders H, et al. Cannabinoids for treatment of spasticity and other symptoms related to multiple sclerosis (CAMS study): multicentre randomised placebo-controlled trial Lancet 2003; 362(9395): 1517-26., 26 Wade DT, Collin C, Stott C, Duncombe P. Meta-analysis of the efficacy and safety of Sativex (nabiximols), on spasticity in people with multiple sclerosis Mult Scler 2010; 16(6): 707-14.]. One study with 12-month follow-up concluded there may be sustained analgesia for pain associated with multiple sclerosis, where about 30% of cannabinoid-treated participants report continued “improvement” at 12 months compared to about 15% on placebo [30 Zajicek JP, Sanders HP, Wright DE, et al. Cannabinoids in multiple sclerosis (CAMS) study: safety and efficacy data for 12 months follow up J Neurol Neurosurg Psychiatry 2005; 76(12): 1664-9.] on doses conservatively limited to a maximum of 25mg THC daily. This suggests that pain relief may be sustained without dose increases. But the study design was not intended to determine the proportion of patients who experienced diminution of effect, or whether dose escalation, even within the set boundary, was needed for maintenance of efficacy. There are risks to be considered in assessing the potential of cannabinoid therapeutics. Cannabis, like other analgesics, can be associated with dependence and a withdrawal syndrome, occurring in a dose-dependent fashion [29 Jones RT, Benowitz NL, Herning RI. Clinical relevance of cannabis tolerance and dependence J Clin Pharmacol 1981; 21(8-9 Suppl): 143S-52S.]. Under controlled conditions in healthy, experienced users of marijuana, withdrawal from a “low” daily dose (ie, oral THC 10 mg every 3-4 hours for 5-21 days) commences within 12 hours, is diminished by 24 hours, and is complete in 48 to 72 hours [29 Jones RT, Benowitz NL, Herning RI. Clinical relevance of cannabis tolerance and dependence J Clin Pharmacol 1981; 21(8-9 Suppl): 143S-52S.]. Other short term experiments with oral THC (20 to 30mg four times daily) and smoked cannabis (1% and 3% THC cigarettes four times daily) reveal an abstinence syndrome characterized by anxiety, irritability-restlessness, insomnia, stomach pain and decreased appetite [31 Haney M, Ward AS, Comer SD, Foltin RW, Fischman MW. Abstinence symptoms following oral THC administration to humans Psychopharmacology (Berl) 1999; 41(4): 385-94., 32 Haney M, Ward AS, Comer SD, Foltin RW, Fischman MW. Abstinence symptoms following smoked marijuana in humans Psychopharmacology (Berl) 1999; 41(4): 395-404. ], with mood effects more prominent at the higher dosages. In research specifically designed to establish the time line of abstinence among regular heavy users (4 cigarettes daily), symptoms peak at 2 to 3 days, and persist for up to 2 weeks, although sleep disturbance may continue for up to 6 weeks [33 Budney AJ, Hughes JR, Moore BA, Vandrey R. Review of the validity and significance of cannabis withdrawal syndrome Am J Psychiatry 2004; 161(11): 1967-77.]. In light of abstinence effects, standard practice in clinical trials administering a maximum of 25 mg THC daily is to use a tapering scheme to conclude therapy, with a 20% per day dose reduction [30 Zajicek JP, Sanders HP, Wright DE, et al. Cannabinoids in multiple sclerosis (CAMS) study: safety and efficacy data for 12 months follow up J Neurol Neurosurg Psychiatry 2005; 76(12): 1664-9.]. Patients discontinuing higher dose cannabinoids for analgesia might warrant a longer tapering regimen, but this has not been studied. Fatal overdose with cannabis alone has not been reported. In terms of acute drug interactions, additive effects of cannabis, anticholinergics, and CNS depressants should expected (e.g., increased sedation, dizziness, dry mouth, confusion). Cannabinoids are metabolized by several enzyme systems, including Cytochrome P450 (CYP 2C9, CYP 3A4) and can induce or inhibit CYP 3A4, but there is little evidence of important drug-drug interactions based on CYP 450 systems. Smoking itself (e.g., cannabis or tobacco) induces CYP 1A2, and may increase clearance of some antipsychotics (e.g., olanzapine, clozapine) and antidepressants (e.g., some tricyclics, mirtazepine) [34 Williamson EM. Drug interactions between herbal and prescription medicines Drug Safety 2003; 26: 1075-92., 35 Wills S. Drugs of Abuse. 2nd ed. London: Pharmaceutical Press 2005.]. Overall then, the acute medical risks of THC as used in clinical trials are rather low. There can be adverse psychiatric side effects. THC intoxication and euphoria can be disturbing, particularly to elderly patients. Anxiety and panic attacks occur, as do frank psychotic reactions (principally paranoia), as well as so-called “paradoxical” effects of dysphoria, dejection, and depressed mood [36 Moore TH, Zammit S, Lingford-Hughes A, et al. Cannabis use and risk of psychotic or affective mental health outcomes: a systematic review Lancet 2007; 370(9584): 319-28., 37 D'Souza DC, Sewell RA, Ranganathan M. Cannabis and psychosis/schizophrenia: human studies Eur Arch Psychiatry Clin Neurosci 2009; 259(7): 413-31.]. Although unlikely to be a factor in the application of cannabinoids for pain, there is concern that early adolescent use of cannabis may heighten later risk of psychosis [36 Moore TH, Zammit S, Lingford-Hughes A, et al. Cannabis use and risk of psychotic or affective mental health outcomes: a systematic review Lancet 2007; 370(9584): 319-28., 38 McGrath J, Welham J, Scott J, et al. Association between cannabis use and psychosis-related outcomes using sibling pair analysis in a cohort of young adults Arch Gen Psychiatry 2010; 67(5): 440-7. ], and evidence that genetic variation (single nucleotide polymorphisms) heightens vulnerability [39 van Winkel R. Family-based analysis of genetic variation underlying psychosis-inducing effects of cannabis: sibling analysis and proband follow-up Arch Gen Psychiatry 2011; 68(2): 148-57.]. Acute cannabinoid intoxication adversely impacts processing speed, attention, learning and recall, perception of time and velocity, reaction time and psychomotor abilities in a dose-dependent fashion [40 Miller LL, McFarland D, Cornett TL, Brightwell D. Marijuana and memory impairment: effect on free recall and recognition memory Pharmacol Biochem Behav 1977; 7(2): 99-103.]. Formal neuropsychological testing in clinical trials reveals mild impairment at usual analgesic doses [6 Wilsey B, Marcotte T, Tsodikov A, et al. A randomized, placebo-controlled, crossover trial of cannabis cigarettes in neuropathic pain J Pain 2008; 9(6): 506-21., 23 Nurmikko TJ, Serpell MG, Hoggart B, Toomey PJ, Morlion BJ, Haines D. Sativex successfully treats neuropathic pain characterised by allodynia: a randomised, double-blind, placebo-controlled clinical trial Pain 2007; 133(1-3): 210-0.]. While cannabis can acutely impair skills required to drive motor vehicles in a dose-related fashion, epidemiological data are inconclusive with regard to the association of traffic accidents and use of cannabis [41 Sewell RA, Poling J, Sofuoglu M. The effect of cannabis compared with alcohol on driving Am J Addict 2009; 18(3): 185-93.]. There is speculation that cannabis use is associated with increased awareness of impairment (e.g., altered perception of time and speed), which results in compensatory behavioral strategies. What is clearer from experimental and epidemiologic data is that driving under the influence of both alcohol and cannabis in combination confers greater risk of accidents than the risk of either drug alone [41 Sewell RA, Poling J, Sofuoglu M. The effect of cannabis compared with alcohol on driving Am J Addict 2009; 18(3): 185-93.]. The longer-term health risks of cannabis are unclear, and the evidence is based on non-medical use [42 Hall W, Degenhardt L. Adverse health effects of non-medical cannabis use Lancet 2009; 374(9698): 1383-91.]. Long-term use of inhaled cannabis may be associated with dependence and increased respiratory symptoms; but some epidemiological studies have not found more lung disease in long-term users, once the effects of tobacco are accounted [43 Tetrault JM, Crothers K, Moore BA, Mehra R, Concato J, Fiellin DA. Effects of marijuana smoking on pulmonary function and respiratory complications: a systematic review Arch Intern Med 2007; 167(3): 221-8.]. Long-term use of inhaled cannabis has not been associated with increased risk of lung or gastrointestinal cancers [44 Hashibe M, Morgenstern H, Cui Y, et al. Marijuana use and the risk of lung and upper aerodigestive tract cancers: results of a population-based case-control study Cancer Epidemiol Biomark Prev 2006; 15(10): 1829-34. ], although a meta-analysis found evidence of premalignant changes in the respiratory tract [45 Mehra R, Moore BA, Crothers K, Tetrault J, Fiellin DA. The association between marijuana smoking and lung cancer: a systematic review Arch Intern Med 2006; 166(13): 1359-67.]. There is some evidence that among individuals with pre-existing cardiac disease, cannabis users have an increased risk of myocardial infarction in the hour after smoking cannabis compared to non-users [46 Mittleman MA, Lewis RA, Maclure M, Sherwood JB, Muller JE. Triggering myocardial infarction by marijuana Circulation 2001; 103(23): 2805-9.]. A recent meta-analysis showed no major residual effects on neurocognitive functioning in long term daily-users of cannabis [47 Grant I, Gonzalez R, Carey CL, Natarajan L, Wolfson T. Non-acute (residual) neurocognitive effects of cannabis use: a meta-analytic study J Int Neuropsychol Soc 2003; 9(5): 679-89.]. THC rapidly crosses the placenta and accumulates in breast milk of nursing mothers [3 Huestis MA. Pharmacokinetics and metabolism of the plant cannabinoids, delta9-tetrahydrocannabinol, cannabidiol and cannabinol Handb Exp Pharmacol 2005; (168): 657-90. ], but there is no systematic evidence of direct or behavioral teratogenicity. In reviewing the possible acute and long term adverse effects of cannabinoids as therapeutic agents one needs also to be mindful that other agents that are used for treatment of pain or spasticity also have adverse effects. Opioids produce sedation, nausea, constipation and dependence, withdrawal from which results in serious abstinence syndrome with much more severe effects – e.g. severe autonomic, gastrointestinal, and psychiatric – than the rather mild cannabis withdrawal phenomena. Tricyclic antidepressants and antiepileptic drugs commonly prescribed for chronic pain have psychotropic (e.g. sedation), anticholinergic (e.g. constipation, dizziness, palpitations, visual disturbance, urinary retention), and neuromuscular effects. Drugs for spasticity produce sedation (e.g. baclofen), hypotension (e.g. tizanidine) and serious interactions with antibiotics (e.g. tizanidine and ciprofloxacin). Benzodiazepines that are sometimes prescribed for spasticity can produce sedation, psychomotor incoordination, memory lapses, and paradoxical reactions, as well as dependence and withdrawal syndromes. Opioids and sedative-hypnotics are also drugs of abuse, and their ability to induce physiological dependence and serious withdrawal states exceed those of cannabis. Therefore, judgements on relative benefits and risks of cannabinoids as medicines need to be viewed within the broader context of risk-benefit of other agents as well [48 Brunton L, Chabner B, Knollman B, Eds. Goodman & Gilman's The Pharmacological Basis of Therapeutics. 12th ed. New York, NY: McGraw-Hill 2010.]. It should be noted that the evidence for efficacy is based primarily on relatively few short-term studies with small sample sizes of selected, mostly neuropathic pain conditions (ie, Phase II/III trials). “Medical cannabis”, now available from dispensaries in some jurisdictions, is not subject to governmental standardization, and its constituents and potency are consequently unknown. Moreover, the mean potency of marijuana seized by federal and state authorities has more than doubled over the past 15 years to about 6% THC, well over 20% of confiscated plants have a potency exceeding 9%, and some specimens exceed 25% THC [49 Mehmedic Z, Chandra S, Slade D, et al. Potency trends of Delta9-THC and other cannabinoids in confiscated cannabis preparations from 1993 to 2008 J Forensic Sci 2010; 55(5): 1209-7.]. Thus, cannabis obtained from dispensaries or other sources may have potency far exceeding that used in clinical trials described in this review. Furthermore, cannabis elicits concerns among regulators, clinicians, and patients regarding issues of misuse, abuse, and other liabilities. With these facts in mind, a potentially useful framework for evaluating advisability of medical marijuana are guidelines released by professional pain societies concerning prescription of long-term opioid therapy for chronic, non-cancer pain [50 Chou R, Fanciullo GJ, Fine PG, et al. Clinical guidelines for the use of chronic opioid therapy in chronic noncancer pain J Pain 2009; 10(2): 113-30., 51 Fine PG, Portenoy RK. A Clinical Guide to Opioid Analgesia. 2nd ed. New York: Vendome Group 2007.]. The guidelines are framed by several questions. One question regards not only the legality of cannabis, but the standard of practice in the clinician’s community, since either prescription or recommendation for use of cannabis is outside of “conventional practice.” As with prescription of opioids there are potential issues of legal liability [52 Jamison RN, Clark JD. Opioid medication management: clinician beware! Anesthesiology 2010; 112(4): 777-8.]. A second question asks whether other treatments offer a more favorable risk-benefit ratio. The answer depends upon a careful differential diagnosis, identification of a potentially responsive pain syndrome (e.g., the strongest evidence is for neuropathic pain), consideration of other approaches (e.g., disease-modifying treatment, ablative interventions, other analgesics like anticonvulsants, noradrenergic antidepressants, opioids, or non-steroidals, and cognitive-behavioral or rehabilitative therapy, or complementary treatments). A third question is whether there are medical and psychiatric risks. The shorter-term medical risks of cannabis are relatively low overall. Risks of hypotension and tachycardia should be evaluated in patients with cardiovascular diseases, as these may be associated with elevated risk of cannabis-associated myocardial infarction. Elderly patients with neurocognitive impairment may be predisposed to adverse effects of cannabis on memory and concentration, while even intact older individuals may be susceptible to over-sedation, and falls due to ataxia. The intoxicating effects of cannabis may be disturbing. A history of severe anxiety or paranoia on prior exposure to cannabis should be sought and would be a contraindication; since patients with serious mental illness (bipolar disorder or schizophrenia) may be particularly vulnerable to these adverse effects, they are unlikely to be candidates. Moreover, there must be assessment of the potential for misuse, abuse, or addiction. This requires a careful examination for history of substance use disorders, and psychiatric illness, perhaps supplemented by formal psychiatric consultation. Screening questionnaires, such as the Screener and Opioid Assessment for Patients with Pain (SOAPP-R) [53 Butler SF, Fernandez K, Benoit C, Budman SH, Jamison RN. Validation of the revised screener and opioid assessment for Patients with Pain (SOAPP-R) J Pain 2008; 9(4): 360-72. ], have been validated in chronic pain clinic populations to stratify patients into “lower” or “higher” risk of future opioid-related aberrant behaviors, and suitably modified might be applicable to assessment of risks for cannabis misuse. Most pain experts consider sobriety a foundation of successful pain treatment. Cannabis use is prevalent in chronic pain patients prescribed opioids and may be associated with current or future opioid misuse [54 Reisfield GM, Wasan AD, Jamison RN. The prevalence and significance of cannabis use in patients prescribed chronic opioid therapy: a review of the extant literature Pain Med 2009; 10(8): 1434-41.]. Patients screened “at risk” for aberrant opioid use, or a history of cannabis or other substance use disorders usually would not be considered eligible for medicinal cannabis. There might be exceptions. For example, there is some evidence that patients with sustained remission from alcohol dependence (ie, sober for > 5 years) are at no greater risk for developing a new onset substance abuse problem than non-alcohol controls, so this population would not necessarily be excluded automatically [55 Schuckit MA. Drug and alcohol abuse: a clinical guide to diagnosis and treatment. 6th ed. New York: Springer 2006.]. Also, a recent randomized trial suggests highly-structured approaches may result in successful analgesia and restoration of function without aberrant opioid use in “high risk” patients prescribed opioids for chronic pain [56 Jamison RN, Ross EL, Michna E, Chen LQ, Holcomb C, Wasan AD. Substance misuse treatment for high-risk chronic pain patients on opioid therapy: a randomized trial Pain 2010; 150(3): 390-400.]. Such methods, which involve a regimen of systematic urine toxicology testing, use of compliance checklists to evaluate for “red flags” of non-adherence to the program (eg, unsanctioned dose escalations, illicit drug use), and enrollment in a substance misuse counseling [56 Jamison RN, Ross EL, Michna E, Chen LQ, Holcomb C, Wasan AD. Substance misuse treatment for high-risk chronic pain patients on opioid therapy: a randomized trial Pain 2010; 150(3): 390-400. ], might be adapted for use in high-risk candidates for medical marijuana. Before embarking on a trial of medical marijuana in patients with prior history of substance use disorders, it would be prudent to establish a similar routine of urine toxicology testing, compliance checklists, and co-enrollment in a formal substance abuse treatment facility, just as is recommended for a trial of opioid analgesics [52 Jamison RN, Clark JD. Opioid medication management: clinician beware! Anesthesiology 2010; 112(4): 777-8.]. Finally, chronic pain may be associated with major depression, which complicates treatment, and which must be diagnosed and independently treated for successful pain management. All of these factors being considered, if the decision is made to proceed, the clinician must formulate and document a treatment plan and the patient’s agreement to abide by whatever guidelines are established. The clinical “trial” would entail establishing a therapeutic “dose,” appropriately monitoring for adverse effects and misuse, and assessing outcome in terms of pain, mood, and function. Based on the literature of efficacy in neuropathic pain, there could be evidence of an effect within a minimum of two weeks. Response rates have been noted to increase, however, between two and four weeks in previous neuropathic pain registration trials for gabapentin and duloxetine [57 Ho TW, Backonja M, Ma J, Leibensperger H, Froman S, Polydefkis M. Efficient assessment of neuropathic pain drugs in patients with small fiber sensory neuropathies Pain 2009; 141(1-2): 19-24. ]; one might select a longer duration in difficult-to-treat cases. Considering all these factors, one would then decide with the patient whether continued treatment is warranted. 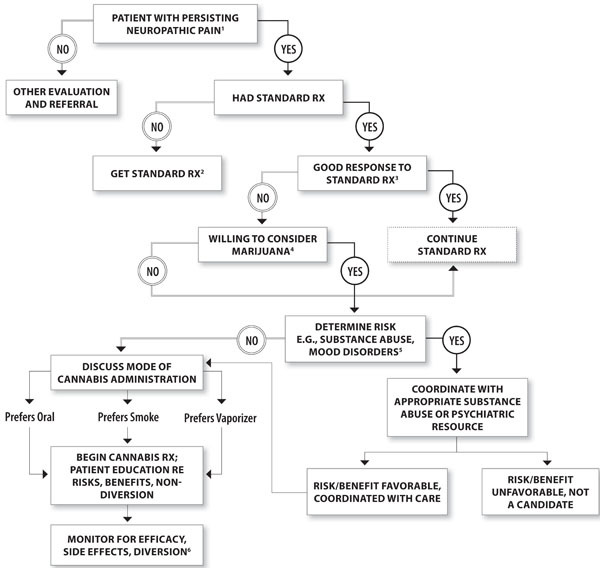 A possible algorithm to guide physician decision-making is presented in Fig. (1 ). Evidence is accumulating that cannabinoids may be useful medicine for certain indications. Control of nausea and vomiting and the promotion of weight gain in chronic inanition are already licensed uses of oral THC (dronabinol capsules). Recent research indicates that cannabis may also be effective in the treatment of painful peripheral neuropathy and muscle spasticity from conditions such as multiple sclerosis [58 Corey-Bloom J, Wolfson T, Gamst A, et al. A randomized, placebo-controlled trial of smoked cannabis for spasticity in multiple sclerosis CMAJ (In press)]. Other indications have been proposed, but adequate clinical trials have not been conducted. As these therapeutic potentials are confirmed, it will be useful if marijuana and its constituents can be prescribed, dispensed, and regulated in a manner similar to other medications that have psychotropic effects and some abuse potential. Given that we do not know precisely which cannabinoids or in which combinations achieve the best results, larger and more representative clinical trials of the plant product are warranted. Because cannabinoids are variably and sometimes incompletely absorbed from the gut, and bioavailability is reduced by extensive first pass metabolism, such trials should include delivery systems that include smoking, vaporization, and oral mucosal spray in order to achieve predictable blood levels and appropriate titration. Advances in understanding the medical indications and limitations of cannabis in its various forms should facilitate the regulatory and legislative processes. The classification of marijuana as a Schedule I drug as well as the continuing controversy as to whether or not cannabis is of medical value [59Drug Enforcement Agency. The DEA Position on Marijuana Available from: http://www.justice.gov/dea/marijuana_position.pdf 2011 January; [cited 2012 March 26];] are obstacles to medical progress in this area. Based on evidence currently available the Schedule I classification is not tenable; it is not accurate that cannabis has no medical value, or that information on safety is lacking. It is true cannabis has some abuse potential, but its profile more closely resembles drugs in Schedule III (where codeine and dronabinol are listed). The continuing conflict between scientific evidence and political ideology will hopefully be reconciled in a judicious manner [60 Cohen PJ. Medical marijuana: the conflict between scientific evidence and political ideology. Part two of two J Pain Palliat Care Pharmacother 2009; 23(2): 120-40., 61 Cohen PJ. Medical marijuana: the conflict between scientific evidence and political ideology. Part one of two J Pain Palliat Care Pharmacother 2009; 23(1): 4-25.]. In the meantime, the decision to recommend this treatment in jurisdictions where use of medical marijuana is already permitted needs to be based on a careful assessment that includes proper diagnosis of a condition for which there is evidence that cannabis may be effective, along with consideration as to response to more standard treatments. Prior substance abuse history, psychiatric comorbidity, and other factors need to be weighed in a risk benefit analysis. Part of this analysis should consider that the potential longer-term harms of the cannabinoids are not fully understood: these include abuse and a dependence syndrome, adverse psychiatric and medical effects in vulnerable populations, and documented risk to traffic safety when combined with alcohol, and perhaps singly [62 Asbridge M, Hayden JA, Cartwright JL. Acute cannabis consumption and motor vehicle collision risk: systematic review of observational studies and meta-analysis BMJ 2012; 344: e536.]. In the long term, as further studies demonstrate whether cannabis is effective for various indications, this should lead to development of novel modulators of the endocannabinoid system which may be prescribed and used as more traditional medicines.